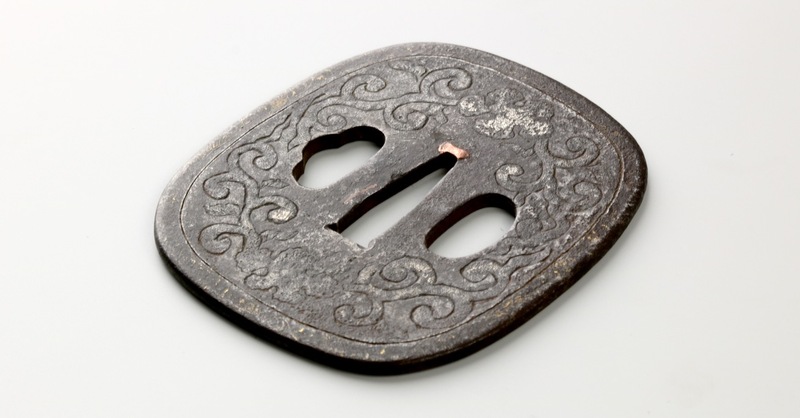 For long, " nanban tsuba " literally "Southern barbarian sword-guards" have been a catch-all classification for sword guards for Japanese swords ( tsuba ), that show foreign influence. a) "Asian Export sword-guards" which originate outside of Japan but were made specifically for the Japanese market. b) "Foreign guards" that made it to Japan, and were subsequently altered for Japanese use. 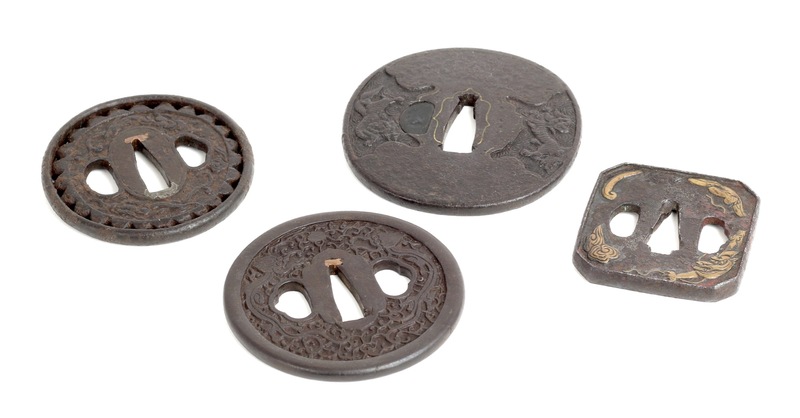 a) "Nanban tsuba" Japanese sword guards made by Japanese craftsmen, inspired by foreign imported styles. 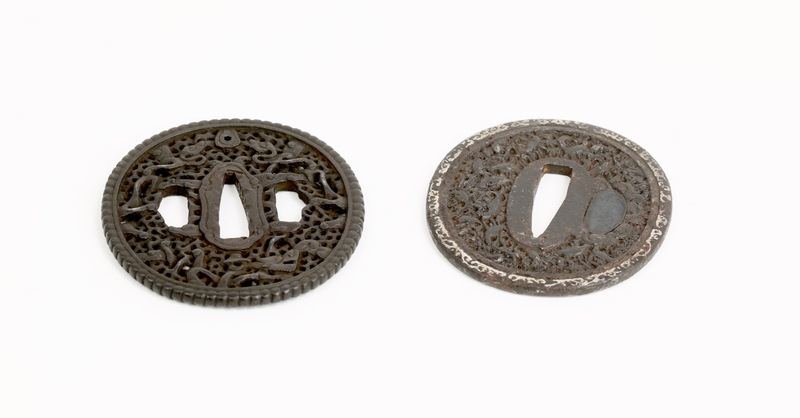 b) " Kiyou-Tojin Tsuba " guards made in Nagasaki's Chinatown, by Chinese makers, for the Japanese market. I became interested in the subject some years ago when I noticed how some of these were not just Chinese in style, but of Chinese manufacture with later adjustments to accommodate their use on Japanese swords. A most fruitful exchange of ideas followed with James McElhinney through his Nanban Tsuba facebook page. He made me aware of the fact that many such guards made it to Japan through gift exchanges related to maritime trade with the Dutch and Chinese. James McElhinney wrote a much anticipated book about the subject and is in the process of getting it published.. Some of the guards that feature in the book are for sale on this page. Because this article is not aimed at Japanese sword connaisseurs but rather collectors of colonial antiques or Asian arms from the cultures these guards may have originated, some basics are in order. 1. Seppa-dai ; literally the "base for the seppa ". Seppa are the washers the Japanese use on either side of the guard to ensure a tight fit. Note how the seppa-dai is typically oval for Japanese swords, matching the oval cross-section of handle and scabbard. On Chinese swords of the 17th and 18th centuries it would be trapezoidal, a stylistic feature seen on some nanban tsuba. 2. Kozuka hitsu-ana ; aperture to accept the kozuka , the handle of the kogatana . 3. 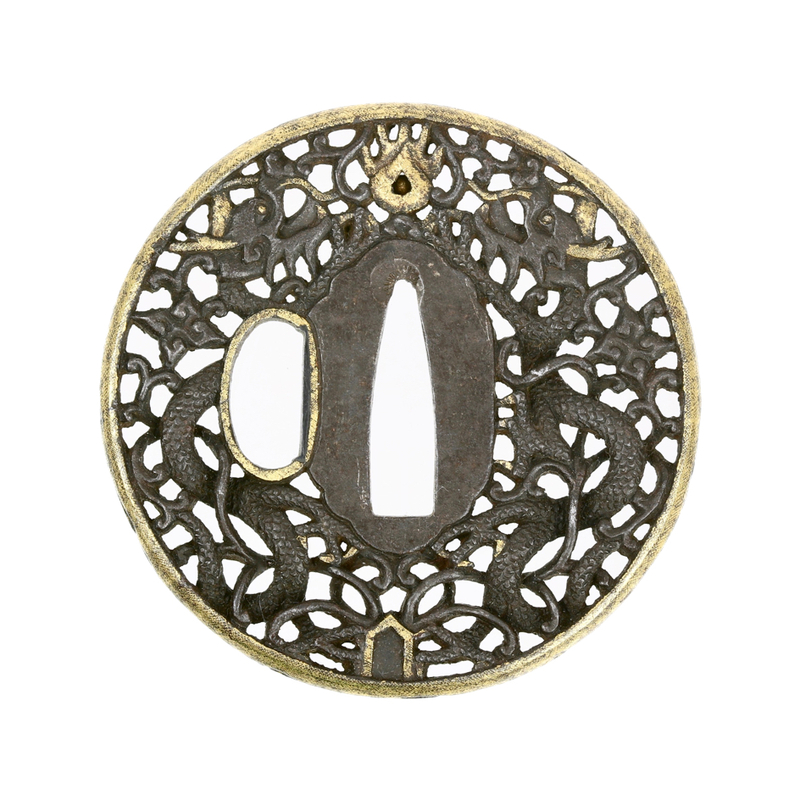 Kogai hitsu-ana ; aperture to accept the kogai , a pin-like accessory. Note the slightly different shape. 4. Nakago ana ; aperture to accept the sword tang. Kogatana (top) and kogai , (bottom) are a small knife and a pin often worn in the Japanese sword scabbard alongside the blade, their handles protruding through the guard. Most tsuba were made for the large katana or smaller wakizashi which were worn thrust through the belt, edge up. 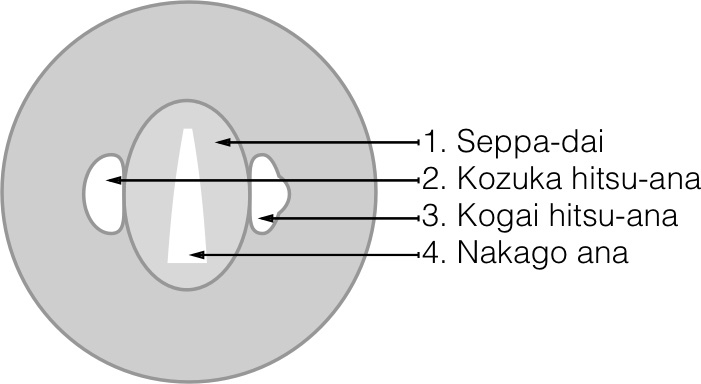 For this reason, the nakago ana is aligned so the edge points upwards in relation to any decoration, if present.1 The Chinese wore their saber with the edge down, so the orientation of the decoration of a purely Chinese guard would be so that the tang aperture has the edge pointing downwards. A Chinese sword guard with after-market apertures for kogai and kogatana . An Asian export sword guard with after-market aperture for the kogatana . It is lined with shakudō , a typical Japanese gold-copper alloy that is patinated to a deep black or dark blue that imitates the look of lacquer. 1. 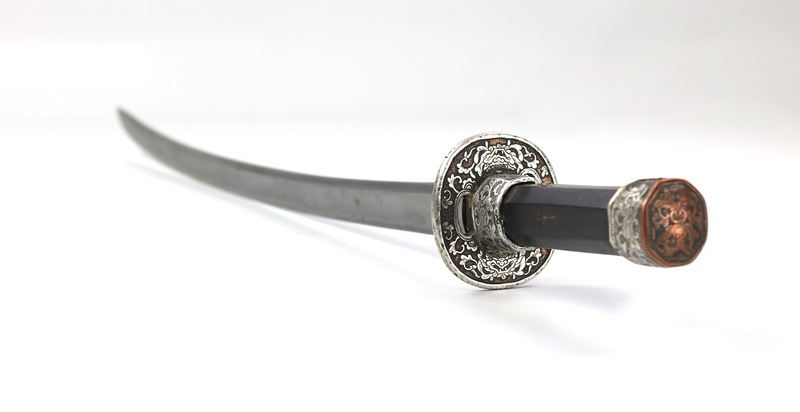 An exception is the tachi , a Japanese sword primarily worn by cavalry, edge down. Tachi were usually fitted with guards with a four lobed profile like this one. 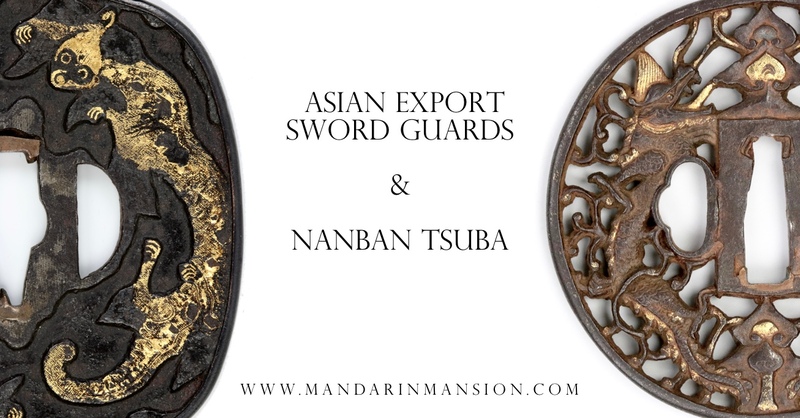 A short introduction to give some background on the networks of cultural exchange that played a role in the manufacture and exchange of nanban tsuba. Asia's biggest player had been very restrictive on trade under almost the entire Ming dynasty and part of the Qing. Trade was only allowed through highly orchestrated "tribute missions" by vassal states although smaller scale smuggling was never fully prevented. Due to the bans, many Chinese started to seek fortune abroad. For example, there were an estimated 100.000 Chinese in Jakarta in the early 18th century. Trade finally opened up under the Kangxi emperor in 1727. In 1757 the Qianlong emperor introduced the "Canton single port commerce system" to help in regulating trade. Japan, too, had an isolationist policy, known as Sakoku or "closed country". From 1641 onwards, Dutch and Chinese ships were allowed entry to a Japanese port, the designated port being Nagasaki. Dutch traders resided on the artificial island of Dejima, and were the only Westerners to be able to trade with Japan. Between 1467-1603, during the height of Chinese trade bans, Japan was struck by a period of social upheaval known as the Sengoku period, and many Japanese sailors, craftsmen, merchants and masterless samurai or ronin fled the country. Because Chinese law outlawed them many sailed on until they found a welcome elsewhere, and many ended up in Vietnam to settle there for many generations. A Vietnamese officer saber of the 18th century. Notice the purely ornamental hitsu-ana in the guard. It were the Portuguese who first discovered a sea route to India around 1500 opening up a much faster and cheaper route for the lucrative silk road trade. The rival Dutch East India Company (VOC) soon followed, taking Batavia (Jakarta) as it's home base and forcing the Portuguese out of Malacca, Ceylon, South India and Japan. Later, the English and French joined in, contesting over India until the rise of the British East India Company that expelled the French and became to dominate India. The colonists opened up new sea routes that effectively connected many countries with each other through trade. The maritime trade routes became like an early internet, a highway facilitating raid exchange of ideas, styles and concepts. 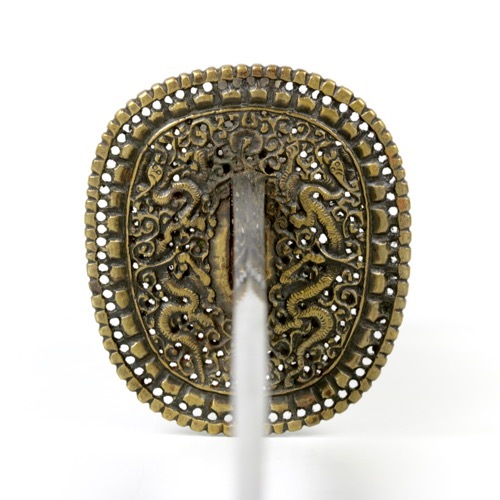 The Kwanto-gata or Kanton style is a symmetrical variant of the Qing-era sword-guard decorated in Chinese-Tibetan openwork designs, sometimes with dote-mimi (raised rim) and sometimes in beaded or milled rims. Both varieties seem to share decorative motifs from embroidered textiles and painted porcelains. In some cases, there is a direct correlation between these designs and the dragon-robes of the Qing imperial court. There is no evidence that either variety were made in Guangzhou or South China. Their Tibetan flavor was very popular with the Qing military establishment. These terms probably sprang from Nagasaki dockside slang, referring to the merchants who imported them. A. Kwanto-gata or Kanton tsuba are characterized by the archaic design of two dragons affronté, chasing a flaming jewel (tama) usually, but not exclusively amid tangled loukong (openwork) interlacing, carved in the round. The term derives from Guangzhou, China’s largest port city during the 18th century, from whence came the majority of Chinese merchants operating in Nagasaki’s Tojin Yashiki (Chinatown). Kaempfer states that on years when no ship called from Batavia, and when the VOC was required to perform its Hofreis (trek) to Edo, the Dutch were forced to purchase gifts from the Chinese. Presumably, that would include Kanton sword-guards. 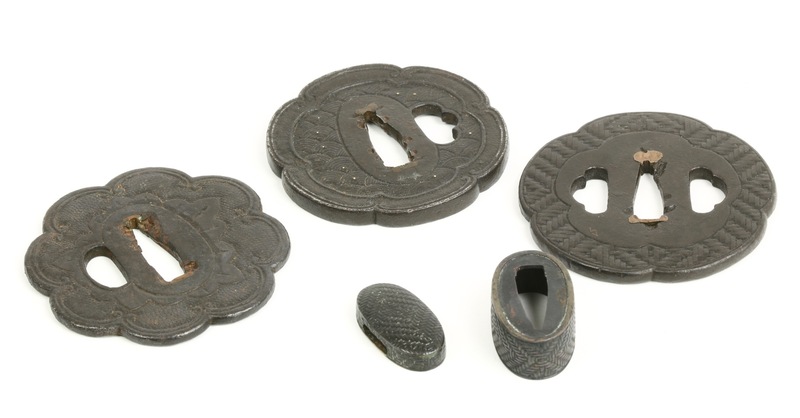 B. Kannan (literally South China) tsuba are nearly identical to Kanton tsuba with the exception that these guards are of asymmetrical design. They may or may not include dragons, shishi or other mythological creatures. They sometimes include representations of bearded foreigners. This variety is sometimes also dubbed Kagonami tsuba, written in the same kanji as Kannan. This may be a pun: Kagoshima-nami (nami = wave, or fashion), alluding to the peculiar relationship between Satsuma and the Ryukyus, which was a bustling entrepôt of foreign trade. The saber of Nurhaci, founder of the Manchu Qing who lived from 1559 to 1626. 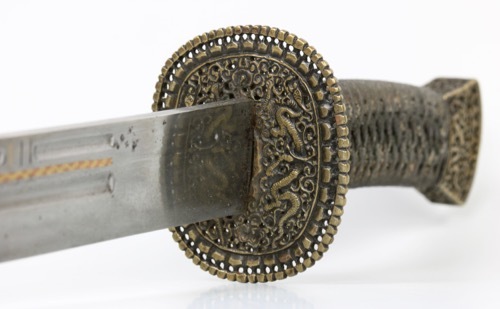 Nurhaci’s sword in turn was based on Tibetan ironwork that came to the Manchus through the silk road trade, often as tribute by Mongol tribes that sought alliance to the Manchus.2 This saber is currently held in the Palace Museum, Shenyang, China P.R. 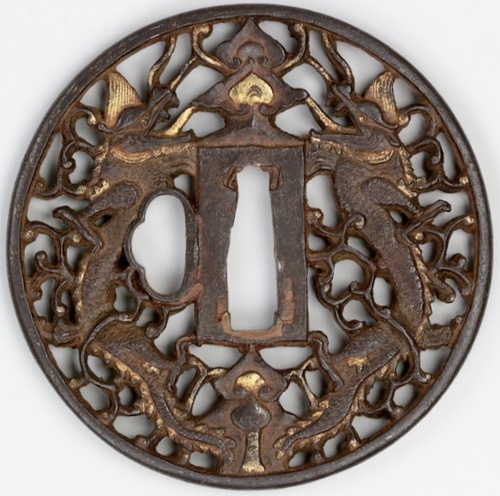 An Asian export sword-guard, made after the "Chinese-Tibetan" style of ironwork popular in China but with stylistic idiosyncrasies that suggest it may not have been made in China at all. The tang plate is angular instead of oval, fitting the Chinese angular handle shape that was popular there in the 16th to 18th centuries. It was later adjusted for Japanese use -presumably after ending up in Japan- by aligning the tang opening so the blade points up, and by adding a hitsu-ana to the side to fit the kogai . A purely Chinese guard, late 17th to 18th century. Note the angular center plate or " seppa-dai " to accomodate the angular Chinese handle of the time. Also notice how the tang aperture is not adjusted, so the blade points downwards. They did add hitsu-ana for the kogai and kozuka . 1. A welcome exception is Dr. John Lissenden's work "The Namban group of Japanese sword guards, a reappraisal". Although a very interesting thesis, it doesn't dive deeply into the foreign origins of this group of sword guards or their historical context. 2. See Di Cosmo: Manchu-Mongol Relations at the Eve of Qing conquest , Brill, Leiden, 2001. 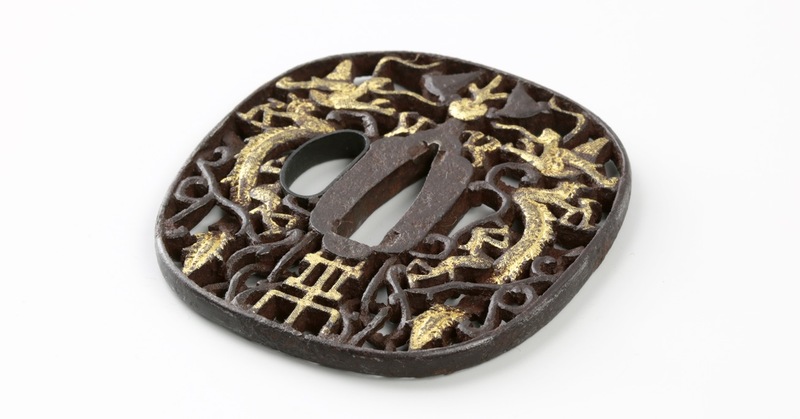 It mentions numbers of "carved saddles" being presented to the Manchus by the Mongols as gifts. 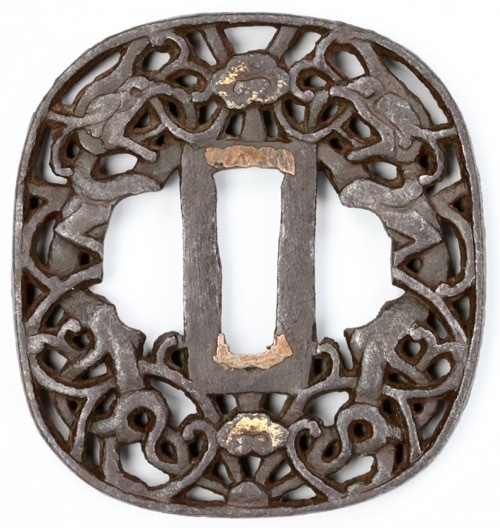 The very best and most prestigious saddles made at the time were those with Tibetan style openwork in iron, which is probably what is meant here. "Foreign inspired piercing and repetition"